Great self evaluation paragraph samples written to help you find success with your performance review. 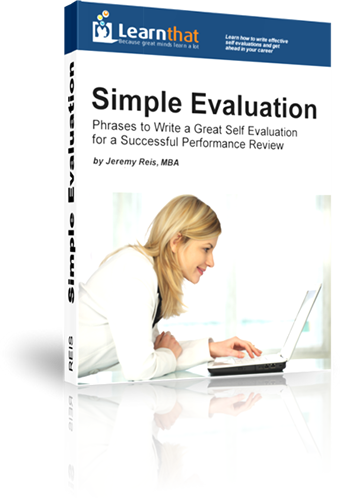 Simple Evaluation contains 450 self evaluation paragraphs in 30 different categories. Each category contains sample self evaluation paragraphs in Exceeds Expectations, Meets Expectations, and Below Expectations. You can write a self evaluation that shines with our pre-written self evaluation paragraphs. Impress your manager and move your career forward by saying the right thing on your performance review! A Performance Review Doesn’t Have to Be Time Consuming or Difficult to Complete! There’s not much in the workplace that is as universally dreaded as performance review time. What is intended for good – helping improve and manage performance – has morphed into a time where both participants feel uncomfortable and a time where you spend a considerable amount of time and energy on paperwork. As an employee, it’s hard to find the right words to describe your rating and on areas you know you need improvement, how do you describe yourself without making yourself look bad? We’ve written Simple Evaluation to help save you hours on writing your self evaluation and impress your manager! There are 450 self evaluation paragraphs written in 30 categories in exceeds expectations, meets expectations, and below expectations. These phrases a professionally written to be descriptive for any situation and are guaranteed to impress your manager. If you struggle to find the right words without appearing full of yourself, or if you struggle to describe areas you need to work on, this ebook will solve the problem for you. This ebook is in PDF format for easy and instant download once you purchase. You are able to copy and paste these paragraphs directly into your own self evaluation. If you want to have a SUCCESSFUL performance review process, buy this book today!